Carpal Tunnel Syndrome(CTS) is a condition that affects the hand and the wrist. It can result from injury to the wrist - dislocated or broken wrist bones or sprains. Carpal Tunnel Syndrome can also be caused by diabetes, rheumatoid arthritis or thyroid disease. Those who are at increased risk are computer users, violinists, golfers, meat packers, assembly line workers, hair stylists and mechanics since they perform the same hand movements repeatedly. It leads to difficulty in performing tasks such as fastening buttons, turning keys and unscrewing bottle tops. Nearly 8 million Americans suffer from CTS. It has been noticed that three times as many women suffer from CTS as compared to men. Read on to find out more about the symptoms of carpal tunnel syndrome and the carpal tunnel exercises that you can perform to prevent it. These exercises do not take long and do not require any equipment. The carpal tunnel is a channel in the palm side of the wrist. The bones of the wrist are arranged in a semi-circle and a tough ligament called the carpal ligament forms a roof, creating a passageway known as the carpal tunnel. The tendons that we use to bend the fingers and wrist and the median nerve run through the carpal tunnel. Lubrication is essential for the normal and smooth functioning of the tendons. 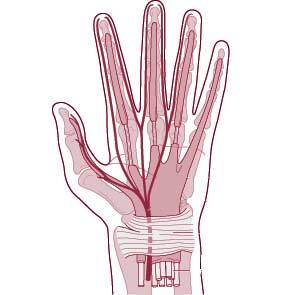 With excessive or repetitive activity on the carpal tunnel, the lubrication system may malfunction. It may not produce enough fluid or it may produce a fluid with poor lubricating qualities. This failure creates friction between the tendon and its sheath causing inflammation and swelling of the tendon area. The swelling squeezes the median nerve in the wrist or carpal tunnel. Repeated episodes of inflammation cause fibrous tissue to form. The fibrous tissue thickens the tendon sheath and hinders tendon movement. This makes moving of the wrist or the hand painful. Symptoms of this condition usually start gradually - frequent burning, tingling, pins and needles or itching and numbness in the palm of the hand and the fingers especially the thumb and the index and middle fingers. In time, these symptoms can spread to the arm and shoulder. They tend to worsen at night or first thing in the morning since many people sleep with flexed wrists. Carpal tunnel syndrome can affect one or both hands and the severity of the symptoms can vary. The hand muscles may become weakened, making it difficult to grip objects. It can also result in permanent loss of feeling. Fine finger movements, such as writing, may become increasingly difficult. In extreme cases patients might feel tingling during the day and the muscles at the base of the thumb may waste away. In some chronic cases people are unable to tell between hot and cold by touch. Make a tight fist with both hands and bend both wrists down. Take your arms out to the sides with the palms facing down. Extend your fingers and stretch through the elbows. On exhaling, rotate your shoulders back and bring the palms facing up. Nerve Gliding exercises: Keep the wrist neutral and bend the fingers towards palm. Now straighten the fingers and bend the wrist and fingers backwards. Stretch the wrist, fingers and thumb backwards. Spread the wrist, fingers and thumb with the palm facing the ceiling. Tendon gliding exercises: Keep the wrist neutral and stretch the thumb away with fingers straightened. Clench last 2 knuckles of each finger towards the palm with the wrist neutral. Slide the tips of the fingers as far past the palm and stretch thumb backwards while keeping the wrist neutral. These exercises should be repeated 10 times. Then the arms should be left hanging loosely at the sides. Shake them for a couple of seconds. First Published Date: Aug 9 2006 Last modified Date: April 18 2019 This page may have been updated recently as new information is available or the content may have been edited for better readability.